These past few weeks I’ve spent most of my free time sorting, scanning and editing old family photos. I’ve been trying to get copies to various family members, while at the same time researching the stories behind the pictures. The photo above was taken in El Sereno and is of my great aunt Doris (who recently passed away) and her daughter Suzie. Suzie says this picture made it into the newspaper and I can see why. Snow in El Sereno? I hope kids in Baldwin Park were able to get pictures of themselves playing in the ice/snow that unexpectedly covered their neighborhood today. If the date is correct, the photo was most likely taken ca. 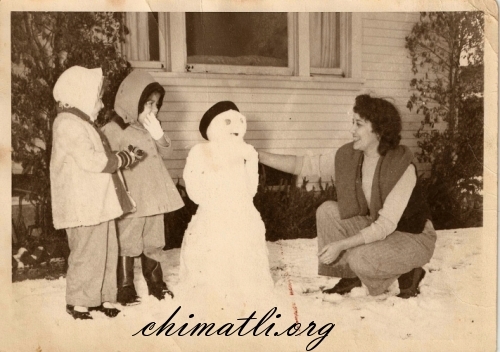 January 10-13th of 1949, when a whole bunch of snow fell all over Los Angeles. Wow! I love this photo. What a great archiving project! Yes, this snow day was a big deal for my grandmother and her sisters. My grandmother would often talk about “the day it snowed in Echo Park.” I was skeptical but this picture proves it. this is kind of random but i came to your blog through a comment you left on the laeastside blog about growing up in south san gabriel and some of the asian-latina/o social mixing that went on while you were growing up. i’m a grad student in american studies & ethnicity at usc writing my dissertation on exactly this subject (asians and latina/os in the west sgv), and would love to talk to you about your experiences growing up in the area. i can tell you more about the project as a whole if you’re open to it… thanks so much in advance for considering this. it sounds like you’d have a lot to say! Yeah, I really like her smile in the photo too! I also wondered about the pants thing, it’s the only photo I have of her or any of her sisters (my grandmother and my great aunt Anita) wearing trousers. You don’t see them outta skirts until the 1970s. I know it’s years since this photo was posted, but I just have to take a chance you’ll receive this comment. Could your great aunt possibly be Dora (Doris) Garcia and my grade school friend, Suzie Garcia??? We (Suzie & I) went to All Saints School in El Sereno from 1950-1958. I would very much like to hear from Suzie.